A recently released scientific consensus statement on the importance of carbohydrate quality has concluded that the type of carbohydrate in different foods causes varied effects on postmeal blood sugar, which has significant health implications, especially with the rise of obesity and type 2 diabetes. Based on the review of evidence from the latest research, an international committee of nutrition scientists has confirmed that a low–glycemic index (GI)/glycemic load (GL) diet reduces the risk of type 2 diabetes and helps control blood sugar in people with diabetes. The statement resulted from the collaboration of the committee of nutrition scientists who met at the 2013 International Scientific Consensus Summit on Glycemic Index, Glycemic Load and Glycemic Response in Stresa, Italy. The nonprofit organizations Oldways and the Nutrition Foundation of Italy organized the summit. The groups have jointly hosted several scientific consensus meetings over the years. The summit’s goal was to develop the consensus statement intended to guide future research and consumer understanding of carbohydrate quality. The scientists reviewed the research on GI, the measure of carbohydrate quality; GL, the combined measure of carbohydrate quality and quantity using portion sizes; and overall glycemic response, or how food and lifestyle affect the body’s management of blood sugar. Based on the consensus statement, the committee recommended that GI and GL information be included in national dietary guidelines, food composition tables, and possibly even packaging labels. The summit also resulted in the formation of an international Carbohydrate Quality Consortium to collaborate and share research. Though not supported by every study, the evidence favors a low-GI/GL diet for diabetes and prediabetes patients, Brand-Miller says. “Randomized controlled trials show that low-GI diets improve glycemic control, blood lipids, and markers of inflammation,” she says. In prediabetes studies, beta cells, which produce insulin, have improved function with a low-GI diet. Even the general consumer could benefit from a low-GI diet, as studies show it reduces the risk of developing chronic diseases such as diabetes and cardiovascular disease, she adds. GI and GL contribute to obesity and diabetes as diets move away from traditional foods, committee member Walter C. Willett, MD, DrPH, the Fredrick John Stare Professor of Epidemiology and Nutrition and chair of the nutrition department at Harvard School of Public Health, said in a video recorded at the summit. Willett explained that as foods become more processed and people become less active, their risk of type 2 diabetes increases. But almost all incidents of type 2 diabetes can be prevented with diet, he noted, with the type of carbohydrate being of particular importance. People should eat whole grain foods, not refined versions; more healthful fats; fruits and vegetables; and smaller amounts of red meat. “Put all those together, and it’s an almost entirely preventable type of disease,” he said. Classifying foods according to their rate of absorption and their postmeal effects on glucose makes it easier for someone to include high-quality carbohydrates in the diet. GI is the best measure of quality, according to Brand-Miller. “The goal is to reduce the GI of the carbohydrate foods in the diet, not get rid of carbohydrate foods,” she says. Rather than minimize the GL, which would translate to a diet containing little carbohydrate, “‘Slow carb, not low carb’ is our slogan,” she says. Diabetes educator Hope Warshaw, MMSc, RD, CDE, who has authored several books published by the American Diabetes Association (ADA), including Diabetes Meal Planning Made Easy, expresses some concerns about the conclusions drawn from the international consensus summit. She says a solid body of research supports several of the consortium’s conclusions, yet other conclusions seem like an overreach based on broader evidence. Her views generally align with that of the ADA, which stated in its recently published 2013 nutrition recommendations for adults with diabetes that the literature regarding GI and GL in people with diabetes is complex. The association noted issues such as the difficulty discerning the independent effect of fiber vs. GI, varying definitions of low and high GI, independent glycemic response among individuals, and the fact that some studies show no improvement with a low-GI eating pattern. Findings from the international consensus summit don’t dramatically change Warshaw’s thoughts on her use of GI/GL. “In my mind, this concept and use in practice needs is far down the list of what most people with type 2 and prediabetes should focus on. The large body of nutrition research and diabetes shows that losing some weight; choosing healthier foods, which includes more whole grains; and more foods with fiber are higher on the priority list and more straightforward to teach and have clients realistically put into action,” she says. 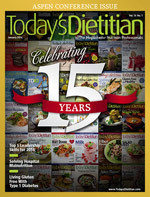 Jill Weisenberger, MS, RDN, CDE, a Virginia-based dietitian in private practice and author of Diabetes Weight Loss — Week by Week, believes there’s value in the GI/GL, but says it isn’t the focus for her patients but rather a way to fine-tune their food choices. “Most of my patients have bigger things to work on, which frequently improve the GI/GL anyway,” she says. “Portion control is a big issue for most of my patients. By cutting back on portions, the GL automatically decreases.” Replacing fast foods and processed foods with fruits and vegetables during the transition toward a more healthful diet naturally lowers the GI but also improves her patients’ diets in multiple ways, she says. Only after her patients with diabetes have mastered other more important skills, such as portion control and energy balance, does Weisenberger use GI/GL. “It’s important not to let GI/GL overshadow healthful and balanced eating. Just like calories cannot be the only consideration, neither can GI/GL,” she says. It also can be confusing for patients to understand that a high- or a low-GI score doesn’t necessarily make it an unhealthful or a healthful food. Carb counting is essential for people with type 2 diabetes, Smithson says, but adding GI/GL to the equation may create confusion. Smithson uses beans as an example. By carb counting, generally a 1/2-cup serving has about 17 g of carbohydrate, but the GL is less than 5 g—a sizable difference. Beans have a low glycemic response because they’re a slow carb, but “we shouldn’t apply these seemingly specific numbers and calculations as the solo guide for diabetes meal planning,” Smithson says. Brand-Miller would like to see dietitians teach the GI “within the context of a healthful diet. So they would teach the sources of good fats and good carbs—high fiber, whole grains—first.” Only then would it be appropriate to bring up exchange of high-GI foods for low-GI foods. GI, while certainly valuable, should be viewed as “another tool in the toolbox of eating plans for people with diabetes,” says Smithson, adding that a variety of healthful eating plan tools should be emphasized when it comes to obtaining the best blood glucose levels.